Drones are becoming an artist’s best friend, helping amateurs and experienced filmmakers create smooth and aesthetically pleasing videos. However, the use of drones for cinematography is extremely challenging as it requires a skilled drone operator and a safe trajectory planned in advance. To solve the problem and allow filmmakers more space for creativity, researchers from the Carnegie Mellon University and Yamaha Motor in Japan developed a deep learning-based system that can create smooth, safe, and occlusion-free trajectories for aerial filming automatically. “Aerial vehicles are revolutionizing the way both professional and amateur filmmakers capture shots of actors and landscapes, increasing the flexibility of narrative elements and allowing the composition of aerial viewpoints which are not feasible using traditional devices such as hand-held cameras and dollies,” the researchers stated in their paper. Using NVIDIA GeForce GTX 1080 GPUs with the cuDNN-accelerated PyTorch deep learning framework, the team trained a convolutional neural network on about 70,000 images from several datasets. Once trained, an off-the-shelf drone, equipped with an NVIDIA Jetson TX2, forecasts an actor’s motion and plans a smooth, collision-free trajectory while avoiding occlusion. 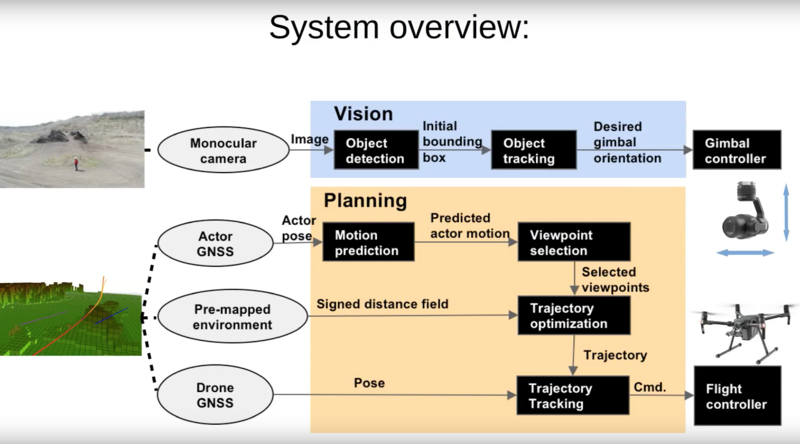 In the video above, the team shows the robustness of the drone and neural network in real-world conditions with different types of shots and shot transitions, actor motions, and obstacle shapes. The drone reasons about artistic guidelines such as the rule of thirds, scale, relative angles, and performs object or person tracking. System architecture. The vision subsystem controls the camera orientation using only the monocular image, independently of the planning subsystem. Planning uses the drone’s and actor’s current location, and the environment to generate trajectories for the flight controller. The work will be presented at the International Symposium on Experimental Robotics (ISER), 2018 in Buenos Aires, Argentina.